Yoga Shiksha Shibir Maharastra 2015Maharashtra Prant Yoga Shiksha Shivir was held in VivekanandaKendra Prashikshan Va Seva Prakalp, Pimpalad, Tryambakeshwar, Nashik, Maharashtra from 16th to 30th May 2015. The reporting day was 15th May and most of the participants had arrived and reported during the day. 15 brothers and 17 sisters reported from all over Maharashtra. On the same day the participants attended the bhajan sandhya and Introductory session, wherein the participants were given orientation for the camp. On 16th morning, Shivir started. The medium of the camp was in Marathi. The 32 participants were organized into three different groups named Patanjali, Vasishtha and Yogeshwar. The Fifteen Day camp had Morning Prayers, Gita-Pathan, Yogabhyas, Shram-Samskar, two Lecture sessions, Manthan, Pathan, Yogabhyas, Krida Yoga, Bhajan Sandhya, and concluded with Prerana se Punarutthan. The lecture sessions were on the topics of: Concepts of Yoga, Rajayoga, Bhaktiyoga, Janayoga and Karmayoga, Concepts of Dharma, Kendra Prarthana, Shrimad Bhagwad Geeta, Maneeya Eknathaji, Swami Vivekananda, Story of Vivekananda Rock Memorial, Challenges and Response, Vivekananda Kendra-Concept and activities. During Manthan Participants discussed over different topics like yam, niyam, science behind our utsavas, meaningful songs from padavali, Swamiji's inspiring thoughts, dialogue between family members and dialogue with society as a responsible citizen etc. Enacted plays on incidents from Swami Vivekananda's life.During Shram-Samskar, participants took care of the cleanliness, arrangement and management of the premises, accommodation, class rooms and dining hall displaying team-spirit and selfless service. 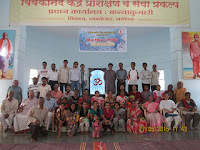 During the Camp, Participants visited holy place Brahmagiri, Tryambakeshwar temple, Sant Nivruttinath samadhimandir. The Shivir went on well in a congenial, spiritual atmosphere with moderate discipline and affection. Many of the participants have expressed their willingness to devout their time and energy for the Service of the society through Vivekananda Kendra. Maharashtra Prant Pramukh Shri Abhayji Bapat presided over samapan satra and addressed the participants.